This Mendota lanyard is made with the finest snap available and durable nylon that still feels soft around your neck. 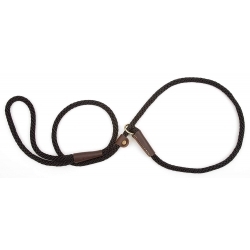 It is made from a solid braid multi-filament UV coated polypropylene cord with leather sleeves, an adjustable leather slide, and two matte-black security clasps. Available colors: Camo, Green and Orange. These collars are made from Biothane which means for those of you that prefer the look and soft feel of leather but worry about water absorption and odor, these new collars are the answer. 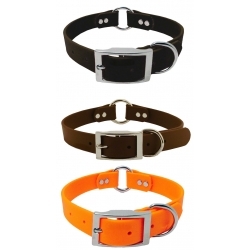 Constructed with nickel-plated hardware and 1" width to achieve a very durable and high quality collar, these collars are a favorite among all field dog. For those who prefer the look and soft feel of leather but worry about water absorption and odor, this material is the answer. Constructed with nickel-plated hardware to achieve the Mendota quality. Available in Black, Orange and Brown. British-Style Slip Leads – Our BEST SELLER! 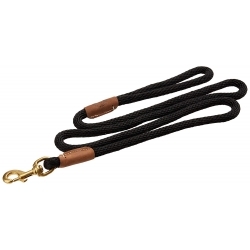 Leash and collar in one combination that is great for training and known for its ease of use. Made of waterproof, vibrant, long-lasting multi-filament polypropylene rope. 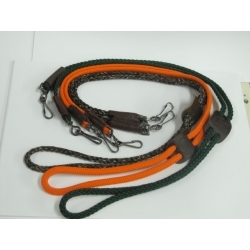 Snap Leashes – Braided snap leash perfect for walking, exercise, or field use.